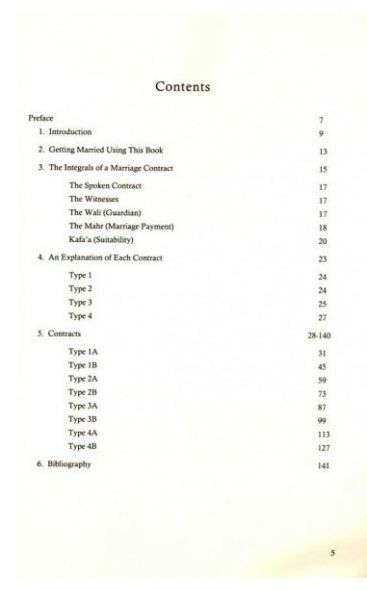 This book is an explanation of various types of valid contracts made convenient. 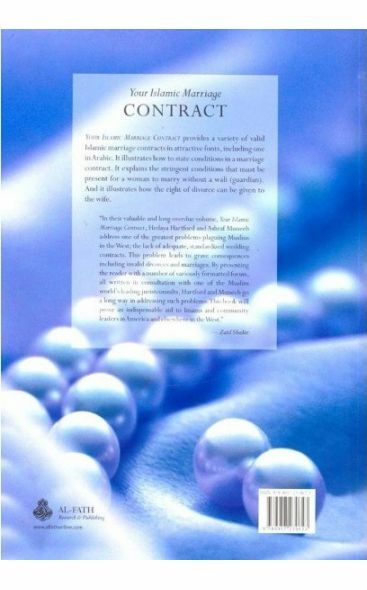 The contracts have been certified by Shaykh Hassan Al-Hindi of Damascus. 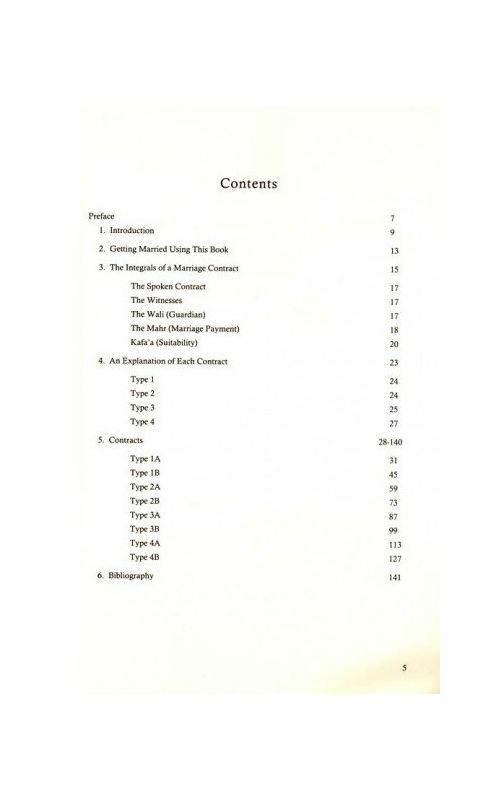 This book is an explanation of various types of valid contracts made convenient. 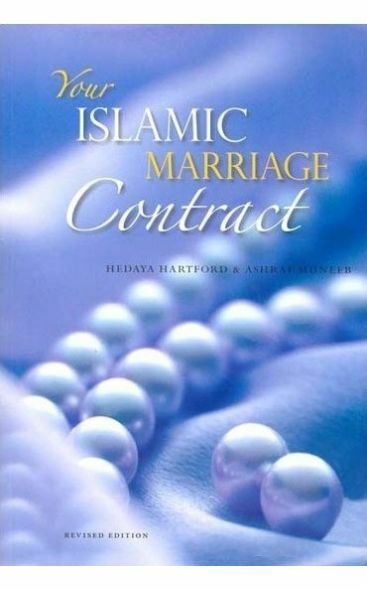 The contracts have been certified by Shaykh Hassan Al-Hindi of Damascus. They should be torn out and used as they are, since a change in the wording of the Type 2, Type 3, or Type 4 contract may cause the stipulations to be nullified. 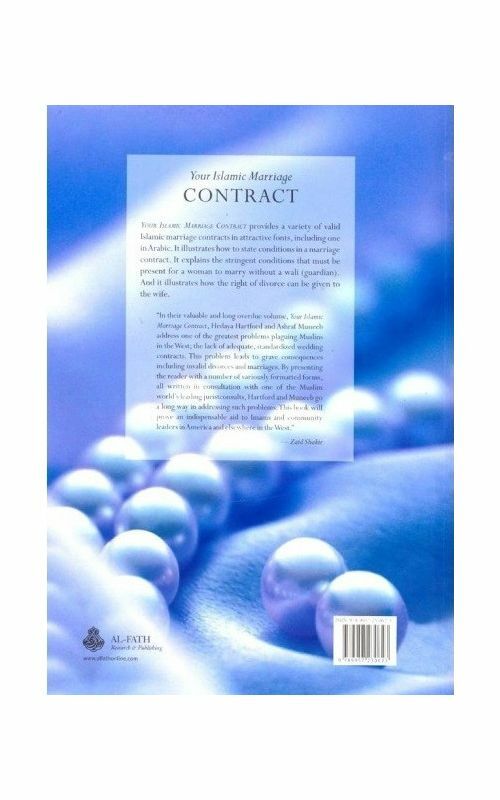 A vast amount of useful information regarding the legal measures of the marriage contract. 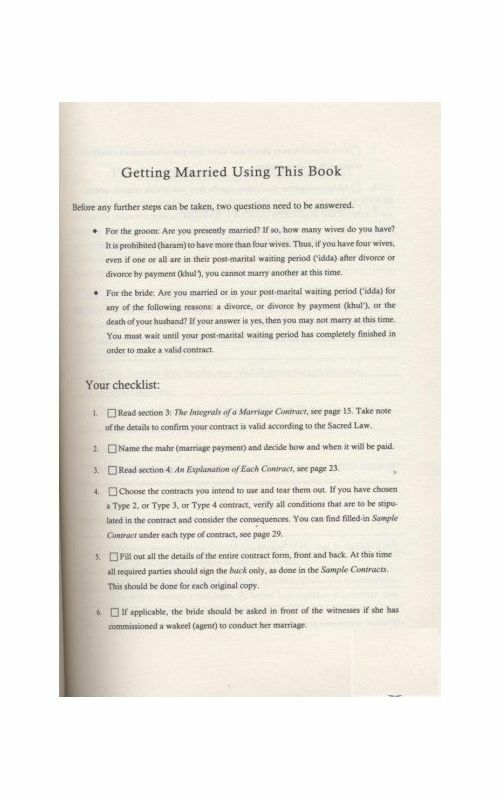 Along with sincere advice on taking protective measures on having a written contract, and registering it legally according to the country of state is explained. 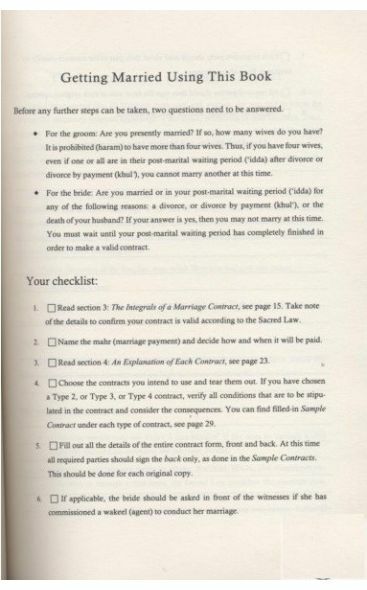 Finally, each contract, after its explanation is presented in one Arabic and 3 English fonts, providing a variety of originals for the bride and groom. 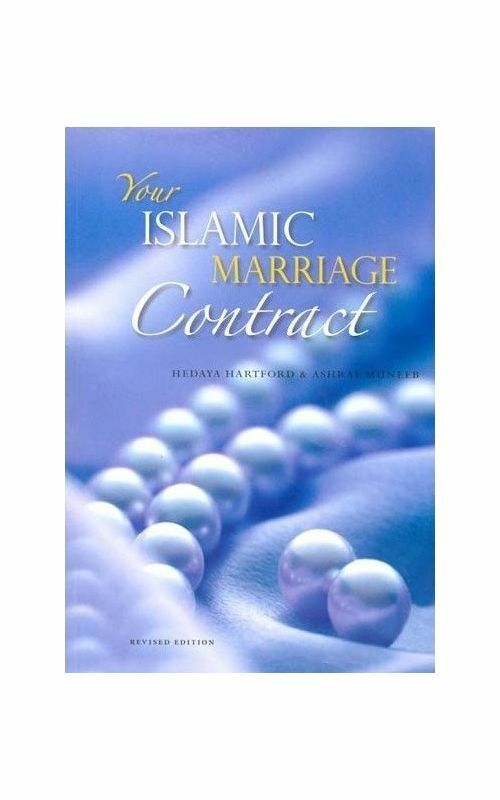 Perfect for anyone planning to be married, already married, or for mosques and Islamic Centers. Nothing of its kind has ever been written in English. In Egypt, Ustadha Hedaya studied for many years with Azhari scholars. She completed the second year of Shariah at al-Azhar; studied Hanafi fiqh with Dr. Abdul Aziz Izzat and Shaykh Fahmi Abdullah; and studied Aqida with Shaykh Abdul Aziz Batishti. In Damascus, Syria, she studied several books in Usul & Hanafi fiqh including the Risala al-Birgivi (Imam Birgivi’s manual on menstruation) with Shaykh Hassan al-Hindi; Hanafi fiqh, hadith and hadith sciences with Shaykh Adnan Darwish; Hanafi fiqh including Risala al-Birgivi with Shaykh Abdul Rahman Arjan; and menstruation and related issues according to the Shafi’i madhab with Shaykh Hussein Darwish, Anisa Hanan Da’doosh and Dr. Mustafa Khin. In Amman, Jordan, she studies Hanafi fiqh with Shaykh Ahmad al-Jammal and tafsir with Shaykh Ali Hani. Dr. Ashraf Muneeb formally began his Shari’a studies in Damascus in 1997, and graduated with honors from the Mahad al-Fath in 2003, as well as privately studied several books in methodology & Hanafi fiqh with Shaykh Hassan al-Hindi; Hanafi fiqh, hadith and hadith sciences with Shaykh Adnan Darwish; Hanafi fiqh with Shaykh Abdul Rahman Arjan; tenets of faith with Shaykh Mustafa al-Turkmani; hadith with Dr. Nureddin al-’Itr; and hadith sciences with Shaykh Bassam al-Hamzawi. Later in Amman, he completed studying inheritance law with Shaykh Ali Hani. In 2006, he received his MA in Islamic Studies (Problems in Family Law for Muslims in the United States) with honors from Imam al-Ouzai, Beirut, and in 2008, his PhD with distinction in Islamic Studies (Effects of Family Law on Muslims in the United States). With his wife, Hedaya Hartford, he has co-authored Your Islamic Marriage Contract; a critical edition and commentary of Risala al-Birgivi in Arabic; and Birgivi’s Manual Interpreted in English. He currently lives in Amman, where he is studying Hanafi fiqh with Shaykh Ahmad al-Jammal and teaching local courses.